Camping Cala Ginepro nestles amid beaches of incomparable beauty, with lush pine and aromatic juniper all around. Cala Ginepro is an area dedicated to the conservation of biodiversity, forming part of Natura 2000 - an EU-wide ecological network. It is an integral part of the Site of Community Importance of Berchida-Bidderosa - SCI of Berchida and Biderosa - which extends across a surface area of 2639 hectares and includes the dune system and the promontory of Capo Comino, the beach systems and the wetlands of Berchida, Bidderosa and Sa Curcurica. 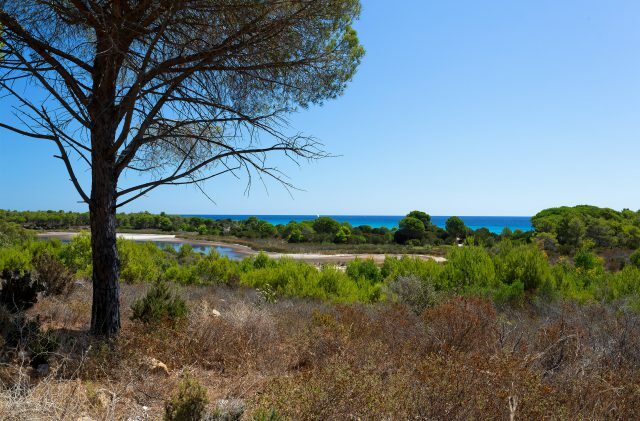 The beaches and the dunes across from Camping Cala Ginepro constitute an area of great interest thanks to the presence of native fauna and flora of European importance such as pink flamingos, and saffron - which cultivation in Sardinia goes back to the time of the Phoenicians. It is essential that our guests make conscious use of the area in which the campsite is located, with a view to safeguarding the whole area and, specifically, the delicate ecosystem of Cala Ginepro. Scattered across Camping Cala Ginepro you will find information panels which are intended to steer you towards respectful use of the surrounding environment. At the access points for the Sa Mattanosa and Cala Ginepro beaches, the wooden walkways facilitate access to the beaches while at the same time safeguarding the dune system, which would otherwise be compromised by being continually walked across. With a view to protecting the environment, at Camping Cala Ginepro we put in place tangible initiatives, including compulsory waste sorting. We implement every action with conviction, in the hope of realising a dream: “Those who come after us have the right to enjoy the untainted environment of Cala Ginepro”.